The main difference between WCF and Web service is that WCF is the Microsoft’s programming model to build web services while Web service is a collection of standards and protocols that allow various applications to communicate with each other. Web service refers to standards and protocols to establish communication between different applications and devices. Therefore, it is not necessary for all applications to use the same technologies and languages. Whereas, Microsoft developed the WCF. It is their programming model to develop web services and related distributed systems. A web service is a set of standards and protocols for exchanging information among two applications or devices. Difference business organizations use different technologies, languages, etc. There should be a common platform for these different applications to communicate with each other. Using web services, the developer can establish this communication. For example, the .NET application can exchange data with some other Java or a PHP application using a web service. It is not necessary for all applications to have the same technologies. 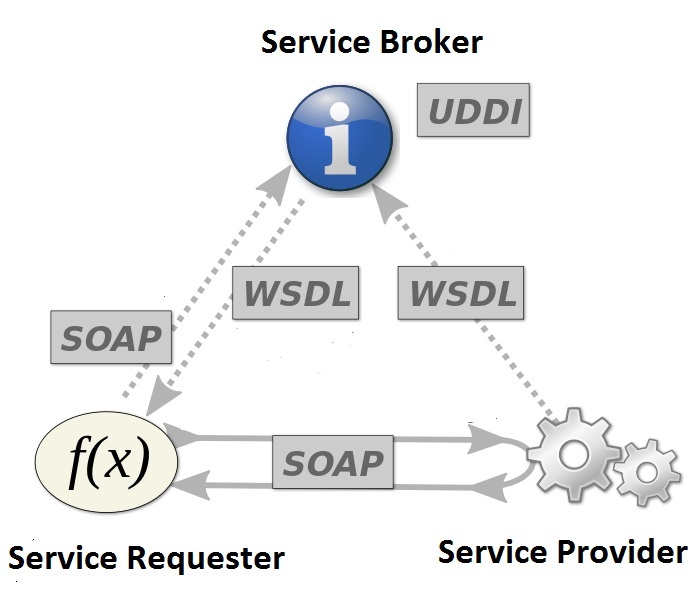 There are two main web services called SOAP and REST. SOAP stands for Simple Object Access Protocol. It provides more security features. Therefore, it is suitable to use SOAP for enterprise level applications. Furthermore, REST stands for Representational State Transfer. A web service that satisfies the REST architecture style is known as RESTful web service. It consumes minimum bandwidth and resources. WCF stands for Windows Communication Foundation. It helps to develop applications based on service-oriented architecture. It is implemented on top of .NET Common Language Runtime (CLR) using a collection of classes. The default protocol of WCF is SOAP, but it also supports protocols such as XML, RSS, JSON, HTTP, HTTPS, etc. One major advantage of WCF is that it supports interoperability. Therefore, WCF application can exchange data with another WCF application on the same windows machine or WCF application that runs on a different windows machine. It is also possible to exchange data with a web service developed using a language such as Java that runs on Windows or some other operating system. WCF is a set of APIs in the .NET framework for building connected, service-oriented applications. Web services, on the other hand, are protocols or standards that are used to communicate between applications and devices on the network. Thus, this is the main difference between WCF and Web service. 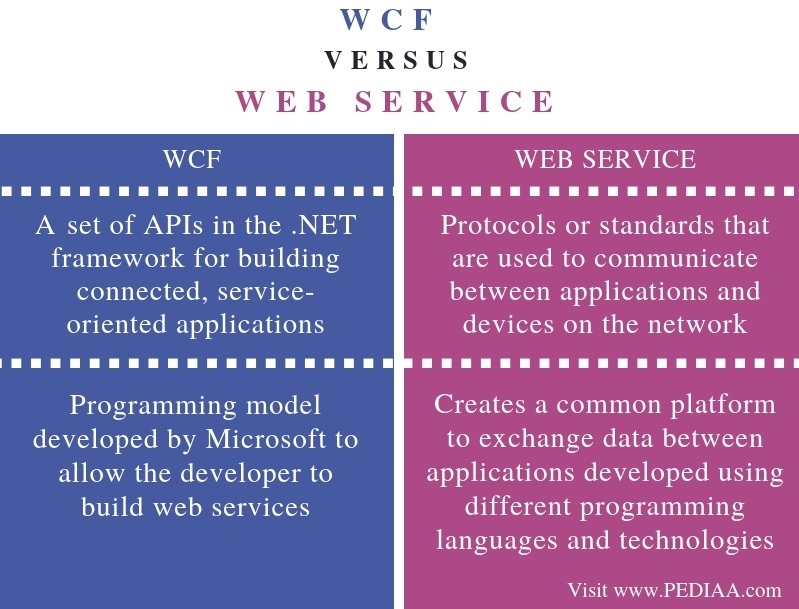 Moreover, WCF is the programming model developed by Microsoft to allow the developer to build web services while web service creates a common platform to exchange data between applications developed using different programming languages and technologies. Hence, this is another difference between WCF and Web service. The main difference between WCF and Web service is that WCF is the Microsoft’s programming model to build web services while Web service is a collection of standards and protocols that allows various applications to communicate with each other. 1. “What Is Windows Communication Foundation (WCF)? – Definition from Techopedia.” Techopedia.com, Available here. 2. “What Is Windows Communication Foundation (WCF)? – Definition from WhatIs.com.” SearchWinDevelopment, Available here. 3. “Windows Communication Foundation.” Wikipedia, Wikimedia Foundation, 14 Nov. 2018, Available here. 4. “What Is Web Service – Javatpoint.” Www.javatpoint.com, Available here.